Is intermingling really more ecological? Or just the stylized look of ecology? This summer the Highline had its four year anniversary. Perhaps the greatest testament to its massive success is the extent to which the strategy of “intermingling” plants—as opposed to solid massings of single species—has been accepted as a new ecological best practice. The traditional horticultural practice of massing plants together in solid blocks is now seen as static and old school. Mixing plants into carefully woven tapestries is the expression of the ecological zeitgeist. Almost all of the world’s planting avant-garde (Oudolf, Kingsbury, Sarah Price, James Hitchmough and Nigel Dunnett, Cassian Schmidt, Dan Pearson, Roy Diblik) have projects that celebrate this mixed style. Statements like these raise several questions in my mind: is intermingling really more ecological? Or is it just an aesthetic that imitates ecology? And what about function? Does intermingling plants result in more stable, lower maintenance plantings? Or does it require more intensive gardening to maintain it? My own experiments with intermingling have been eye-opening. I wanted to record a few of my own thoughts about intermingling and also hear your reactions to this rising trend. Does intermingling create an ecology? Mixed planting schemes most certainly evoke the look of a natural plant community. For me, this aesthetic is one of the main artistic benefits of intermingling plants. It is more visually dynamic, and when done well, can be incredibly evocative of natural plant communities. But the question of whether mixing plants actually creates better ecological function is a claim that I’m not sure can be definitively made. Upland forest; photo by Nicholas Tonelli via. I’d first like to point out that plants growing in solid masses occurs all the time in nature. I recently came back from a hike through the Shenandoah National Forest. What struck me was the strength of the vegetative patterns: large sweeps of Hay Scented Ferns ran along slopes; entire rooms of Hamamelis were carpeted with Pennsylvania Sedge. And these examples are not outliers. In fact, I’d even argue that more established plant communities exhibit a higher degree of easily discernible vegetative patterns—more legibility—than recently disturbed communities. 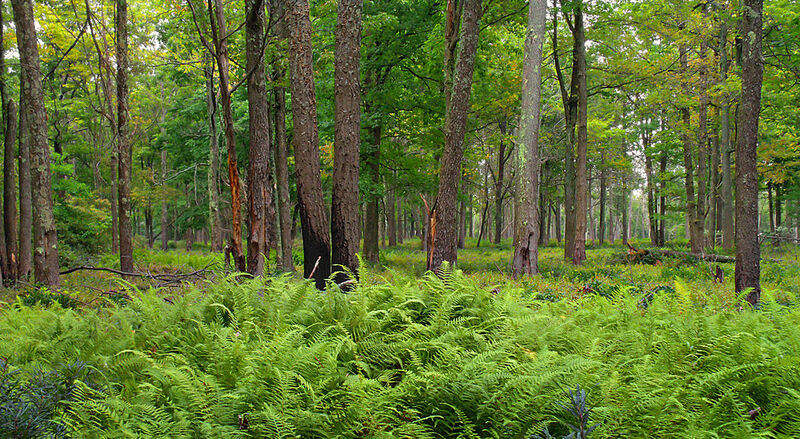 In established plant communities, plants have learned to co-exist in separate layers. Each layer has one or a small handful of dominant plants. Intermingling often exhibits itself as a result of disturbance, which restarts the process of succession. So at least for me, highly intermingled planting schemes are often more reminiscent of plant communities in transition (disturbance) than plant communities in climax. Of course, there are many examples of highly mixed plant communities and many examples of highly massed plant communities. The fact that both can be found in the wild raises questions to me of why intermingling is the more natural aesthetic, whereas massing is less so. Why can't both compositional strategies can be used to evoke moments in nature? So how could we test the claim that intermingled plantings create better ecological function? Here is an experiment I would love to see done: take two plots of open land, each ten-square meters in size. In one plot, plant thirty species of perennials in clean clumps (masses); in the other, mix the exact same thirty species randomly. Then measure their performance. Did one attract more wildlife? Were pollinators more active on one than another? Was one more stable (did it resist weed invasions and persist) than the other? Here’s my hypothesis: both would perform similarly on all ecological measures for the first few years. Whether an Echinacea is rubbing shoulders with a Sporobolus as opposed to another Echinacea would likely not affect ecological quality. The species selection itself is the primary influence of ecological function. But would composition matter? Here is where we head into a gray area. Yes, I absolutely think the way plants are arranged affects ecological quality; however, I do not think intermingling necessarily makes for more ecological quality. A poorly composed intermingled planting (I’ve had more than my share) can be a functional and aesthetic mess. More aggressive species overtake more demure ones. Slow to establish (but often longer living) species can be eaten by quicker establishing plants, reducing diversity. Taller plants can shade out shorter plants; clumping rhizomatous species can choke out ephemerals. When humans attempt to create artificial ecosystems, any number of unforeseen variables can introduce competition, often at the expense of the original composition. Intermingling plants requires a high level of skill and knowledge. It requires an almost intuitive understanding of how plant morphology is related to its competitive strategy—a skill that so few teach, and even fewer understand. As more designers want to imitate the Highline or other celebrated projects, it opens the door to chaotic plantings. A bunch of bad imitiators could turn the public off from a wilder aesthetic. However, well-designed mix planting can actually replicate much of the function of wild plant communities. A robust ground-covering layer holds the ground and resists weed invasion; medium-sized clumping plants can spread slowly and regenerate themselves over time. Taller plants can provide structure and stability through time. If a planting actually replicates the functionality of a plant community, then I do think the claim that it is more ecological could be valid. So for me, I wish the emphasis were less on intermingling and more on plant community-based design. Plant community-based design may use masses of plants in certain layers and mixed plantings in others. The degree of mixing or massing can be determined as a result of the designer’s aesthetic and functional goals as well as the degree to which it exists in wild communities. The important point is not so much whether plants are mixed, but whether each functional layer of a community is present in a planting. This is precisely what Claudia West and I will be exploring in our book. What I’m actually more interested in are plantings that balance legibility with intricacy. I wish the discussion would shift away from intermingling and more toward how we can create plantings in designed landscapes that are both attractive and ecologically dynamic. I’m imagining something like a carpet of grasses that from a distance appears as a single species, but upon closer inspection, reveals a multi-layered matrix. Or balancing a highly interplanted scheme with a large sweep of a single species to create contrast and visual relief from the complexity. The work of English landscape architects James Hitchmough and Nigel Dunnet does exactly this: focuses on how to make functional communities that the public can accept (often using annuals as way of increasing public tolerance for wild plantings). Whether a planting is mixed or massed should not be the standard by which we evaluate ecological quality. People’s tolerance for simplicity versus visual cacophony varies greatly. Let’s not strap down ecological quality to a mixed style. After all, a mixed planting can be just as poorly executed as a conventional massed planting, and often, even more visually chaotic. And by all means, let’s not eliminate massings of single species from our toolbox. Massing may be “conventional,” but in order for designers to create dynamic plantings that can withstand the pressures of urbanization and climate change, we need ever compositional tool available. Thomas, I'd really like to talk to you but I emailed and got no response. This seems (together with the 'matrix' concept - see my last comment in the mulch discussion) such a goodie for thinkingardens?? Much food for thought here. In uk at least, 'wildlife' is said, according to research which I thought came from Sheffield Uni., to thrive in almost any garden.So the ecology thing is interesting but I suspect a fashionable blind alley. Might be better if designers stopped encouraging people to dig up settled and ancient ecosystems, eg meadows, in order to create - err - 'meadows'. But the aesthetic question is a biggie. And you speak wise words. Need more illustrations? Or your book? Though this makes me really conscious, maybe for the first time, that a book is so far from the discussion and exchange that web based material offers...But all these media work together, in a kind of intermingled way...! I think your matrix experiment makes a lot of sense to me. It seems to blend the best of both traditional massing (visual legibility, ease of maintenance) with the best of interplanting (visual diversity, whimsy, extended seasonal interest). This is where I hope the conversation goes: towards compositional strategies that are functionally stable, aesthetically interesting, and ecologically dynamic. It’s interesting to hear about designers encouraging people to dig up settled ecosystems. Is that something that happens a lot in the UK? I don’t hear it much here, unless you are referring to ecological restorations aimed at removing invasive species. That does happen (thankfully) here, but the process is fraught with challenges. Yeah, let’s put the conversation on thinkinggardens. How plants are composed for ecological aesthetic/function is a very topical and I’m sure you’re thoughtful readers would have much to contribute to this topic. Umm...does that mean I might persuade you to write a version of this post for thinkingardens? Can we discuss on email? Have you changed your email so the one I have doesn't work? Shall I ask you a few more irritating questions? Maybe I could get Noel to do a piece in reply to one from you? Excellent post, Thomas. I have been experimenting with wild intermingled plantings in public spaces and I believe the structure and the edges are crucial to the public accepting them. If the planting is bordered by well designed hardscape (paving, wall etc) or at least a 5 foot border of mowed grass the planting will read manicured, cared for and will be palatable to the public. If the "mess" is bordered by intentional tidiness then the public has a cue to the plan and will be more open to accepting it. The high level of maintenance of the hardscape (and the plantings) at the HIgh Line is a crucial ingredient to its success. Getting a municipality to be on board to keep the outside of the garden in excellent shape is fairly easy with their skill set. Getting them to keep the plantings maintained needs to be left to well-trained gardeners, in our volunteers. I knew you would have some thoughtful additions to this conversation—particularly since your work bridges the private and public sphere. I really like your concept about bordering the “mess” with a clean frame of something. American landscape architect Joan Nassauer talked about this same concept of “orderly frames”—neat borders that helps a planting relate to a more structured environment. It’s an interesting point you make about the High Line. So much of intermingled plantings simulate an ecology of transition. The High Line is simulating the spontaneous vegetation that once grew on the railroad-a sort of early successional plant community. If that plant community were allowed to mature (as soil accumulated and woodies emerged), I’m sure the community composition would change. To keep Oudolf’s plantings in a perpetual state of early successional planting, it has to be intensely gardened. This is not a bad thing—I would argue—but it certainly does not strike me as something that is terribly stable or enduring. Perhaps nothing designed with herbaceous species can really be that enduring or maintenance free. But it still feels like a worthy quest: which compositional strategy gives us the most bang for the buck? How do we arrange plantings that endure? It is certainly not something we’ll easily resolve, but I am happy that this is where the conversation is going . . . it’s the right dialogue. This is so true. A piece of planting growing quite wild will be transformed if it's framed in some way. And the idea of 'frame' is great: you can think of explicitly presenting a picture. I read your post with interest as I am currently tackling Oudulf and Kingsbury's latest book. I agree about your point of plant succession. The high line project is for me an 'emergent' planting that in its earliest stages of development. It uses shrubs and trees that can be coppiced each season or ones that only cast a light shade. This keeps the planting from developing into a 'climax' community where a few species dominate and so allows a wide ground flora to be built up in layers that 'intermingle' as they put it. This effect becomes harder to achieve with lower light levels such as in dry shade, but here the use of larger dominant clumps that are more tolerant of the conditions can be interspersed with attractive perennials in smaller groups that are situated to take advantage of varying lighting levels. In my own designs I try to pick up on both the mass grouping and intermingling of plants depending on the situation. I also think we often overlook the question of planting density. Plant numbers can be varied to provide interesting transitions between areas and to accommodate varying light and moisture levels available on a given site. For instance I am starting to use Carex species in this way, utilising different forms and colours in varying densities to blend larger shrubs and perennial groupings. Great points. Your description of the High Line as ‘emergent’ is an apt one. The maintenance implications raise equally interesting questions. I personally don’t mind that the High Line requires a high degree of maintenance. It is an art that celebrates the patterns of emergent vegetation—and quite a moving one. What bothers me is not that it is high maintenance, but that the mixed planting style is sold as more ecological. It certainly can be, but that claim has some serious limitations, too. It’s worth having a robust dialogue about those limitations. Your point about density is a great one. Seems like density itself is another compositional “tool” that can allow designers to play with how plants overlap (or not). I’d love to see how you’ve done this with Carex. Its sounds both beautiful and functional. Great to hear from you. Hope you stop by again. I agree with Anne, it does not make sense to disturb land and then plant non native perennials when in fact we have a 35 year old seed bank of wild flowering perennials laying dormant in our lawns. (This is probably not the case in urban and some suburban landscapes) but in upstate NY where I live I have discovered that it is true. After just a short time of no mowing red and white clover start to bloom followed by eggs and butter, vetch, cone flower,daisy, queen Ann's lace, and black eye Susan, etc. I think the perennial driven planting style of Oudulf makes sense on a 'small scale' or large institutions that can afford the labor of cutting back so many perennials. As I age I am slowly removing perennials in favor of flowering shrubs to cut back on all the labor of cutting everything back. The meadows around my house have influenced my planting style more then anything else. At different times 3-5 plants come into bloom and you see the large drifts repeated over a large area. By high summer it's the grasses but there are still a small number maybe 5-7 total covering a 15 acre area. This is interesting to me. I was not aware that people are disturbing land to plant non-natives. Does this happen a lot in update NY? I totally agree with you about loving spontaneous vegetation. In the late spring, the highway right of ways around the DC are filled with a mix of mostly invasive (and some native) spontaneous vegetation that can be beautiful in both pattern and composition. I feel like I have a lot to learn from these undervalued landscapes. This post and all the comments are so usefull -- thanks. Have you looked at the work of Giles Clement? Your reply above made me think of him. I've read a little about Clement, but would certainly love to learn more. Wish I could have him for a professor! Big thing in UK at present - a great number of things from massed plantings of annuals, or of perennials, or both, or attempts to create meadows by stripping top layer off a -- meadow. All called "meadow" in order to really confuse everyone. And no-one really yet values our ancient meadows so they cheerfully dig them up for the above purposes. Or to plant trees! Wish they wouldn't. they have great ecological and historical interest. Thomas, you're asking some big questions, I'm sure you're already aware--questions that might require years of scientific study to answer with any certainty. I can only contribute anecdotal experience of maintaining a garden that combines some mass planting and some (increasingly more) highly mixed or intermingled planting. Over time, since I allow self seeding, the garden changes, sometimes toward serendipitous combinations, sometimes not. I'm convinced my garden is an "artificial" (meaning created) ecology, and it is an ecology that is evolving over time. Initially, little self seeding occurred but that has increased dramatically over the years. I do control it, editing out many plants in the "wrong" positions, but I also find the plants want to find their own best positions, which, for me, is an important aspect of ecological design. You mention that highly intermingled planting schemes are more like communities in transition due to disturbance. I agree with you. I see that occurring in my own garden. In one area, for example, where I allowed rushes to seed in among a mass of Aster tartaricus "Jin Dai', the rushes appear to be winning the battle. I'm not yet sure I want that to happen. The happy thing is I can pull all the plants out of that area (massive disturbance, human induced!) and replant, restarting the process. As my garden matures, I find the opportunity to do this a pleasant challenge, and an act of great hopefulness. Perhaps there's an analogy with the felix culpa, the fortunate fall, here, to veer into the realm of metaphor. I'm curious about the book you refer to, being written with Claudia West. Have you written about this elsewhere? Do you have a publication date? Yes, I totally agree a lot of these questions can (and should) be answered in a more scientific way. And perhaps that is part of the problem. We designers/gardeners are a speculative sort, eager to do the right thing, but with little to guide us other than our own experiments. In many ways, every garden (both naturalistic and traditional) is an experiment with these exact questions. Your blog and garden are so captivating to me because I feel like you are dealing with these questions on a daily basis. And with great success as well. I learn from it all the time. Always grateful for your boldness in sharing it. “Felix culpa”?! I have never thought about applying that concept to the garden, but I’m rather captivated by it. As always, you’ve given me much to ponder. I hope you consider a post that explores this metaphor. It’s rich. The book we are writing is through Timber Press. Its subject focuses on design inspired by plant communities—with the goal of creating more stable and beautiful plantings. We are in the early stages of writing, but its been a fascinating journey. Its likely due out in 2015, but nothing is set yet. Before I say anything else, may I say how much I enjoy your writing, Thomas? It gives me a different perspective and is always thought-provoking. I am often surprised by the huge gap between those who design landscapes and gardeners. Both groups could learn from each other! About this idea of intermingling, well, it reminds me of Humpty Dumpty and his 'words mean what I mean them to mean'. Even if a patch is planted in blocks of a few species, if you back off and look at it as part of a larger area, you still have intermingled species. The fact that all of one species is grouped over here and all of another over there doesn't change anything. Maybe the real issue is the paucity of species used. As a gardener, I can't see that an intermingled landscape will survive long without determined intervention any more than any other type of planting. The only natural occurrence I can think of where a combination of intermingled species persists for the long term is Prairie. The only reason prairie doesn't change over time is that the habitat is so harsh that only a few species can survive. If trees could grow in a prairie area, they would. So it is basically a habitat where natural succession has halted because of (usually) climate constraints. In a managed landscape, the idea of intermingled species probably appeals to planners who think that no maintenance will be required. This is like all the home gardeners who think a wildflower meadow is no-maintenance. As Michael comments, in a public landscape, the edges are everything. Inside a tidy and controlled edge you can get away with almost anything. Not as easy in a smaller space or a space broken up by a lot of paths, seating areas and so on. So the practicality of an intermingled landscape comes down to balancing the work of keeping the edges refined against the work of keeping the plant succession at the stage you want. Left to its own devices, any landscape would soon become a weed seed reservoir. Not popular with other gardeners, and usually not very attractive. And why not a combination? Some part of the landscape with blocks of species, some with intermingled species. This would mimic Nature rather better. In my own situation, with almost 30 acres of mixed woodland, rock ridges, marsh and so on, succession is an inescapable fact. Trying to control it would be like trying to organize the waves on the ocean. I thoroughly enjoyed your comment, particularly the image of trying to “organize waves on the ocean.” It’s true. And I thought your comment about massed plantings still being intermingled, but at a larger scale was very interesting. Yes, even massed plantings have edges that bump into other species. And your point about the stability of intermingled plantings is a good one. The prairie analogy is nice. Perhaps my question is this: can designers/gardeners find examples of stable plant communities for their own climates that might be inspirations for their plantings? Can we devise thoughtful ways of layering species that mimic the kind of stability that climax communities in the wild have? Seems at least in theory, that this is possible. Its why I think focusing the conversation on “intermingling” is the wrong way to frame the future direction of planting design. Perhaps the better frame is creating enduring artificial communities . . . Thought provoking. There is much to consider on the horizontal and vertical planes both above and below ground as well as on the time continuum. As a designer, I haven't had clients who care much about this, but I also have a property where I have been able to do things "wrong" and then observe what happens through a process of letting things happen w/o interference and see what patterns of recolonization occur. I look forward to your book. Yes, it’s a lot of “axes” (horizontal, vertical, through time, above soil, below the soil) to think about. And with plants, there are a hundred other variables going on. What makes this so fascinating (and so challenging) to do well. Were you pleased with the results of not interfering? Or not. I’m always interested to hear more about what happens when people “let go” . . . I of course can't find it now, but in school we read a study that looked at the wildlife attracted to very large sweeps vs. very interplanted. The conclusion (of the very small sample--tended by home gardeners--so it's far from end all, be all) was that the larger masses attracted more wildlife faster. Again, my memory is a bit hazy on the details but I think they were looking at butterflies and that Butterfly X needed X amount of food. Thus, planting one milkweed plant in your garden was insufficient; you needed to plant the whole garden in milkweed for them to quickly "find" you and want to come back. I'll try to locate the study because I'm probably messing up some of the details. I just wanted to put it out there because, increasingly, I'm turning to ecological studies and empirical evidence as to what works and what is just HGTV hype. Obviously, as a designer, it's my job to make it look pretty, but I'm trying to bring some science into this art. I've read something to that effect as well, though I couldn't remember a source. It does make sense, of course, that a critical mass of a plant is needed to support a pollinator. I hope better researchers than me will do more studies along those lines. As designers and gardeners, we need that information. Let me know if you find a link . . . my speculation needs to be grounded in a bit more science! This also gets into the question of scale. The intermix in the context of say the Highline doesn't translate into residential scales as well as it does park scales. Residential landscapes are already fairly intermixed. At a large scale you can have a mass of 50 plants only be a little spot in the larger tapestry Whereas in a residential landscape that same spot would be a single plant. Here's why people think gardening is hard work (and maybe it is): "A poorly composed intermingled planting (I’ve had more than my share) can be a functional and aesthetic mess. More aggressive species overtake more demure ones. Slow to establish (but often longer living) species can be eaten by quicker establishing plants, reducing diversity. Taller plants can shade out shorter plants; clumping rhizomatous species can choke out ephemerals." What happens when we put a nitrogen fixing plant next to a nitrogen hog? In the very least, our public gardens should be very well thought out both above and below the soil surface, and if seems like you're saying this? If you look at a wild prairie, it shifts from year to year --- wildness favors bust and boom cycles, mixed and monochrome. A home gardener will not stand for this evolution when every plant must be in the right place at the right time in the right way and be the same from year to year (which is impossible of course). I think the best we can say to a regular gardening audience is suggest native plants in any landscape style you choose to put them in, but understand that as PLANTS they will seek out what they like, and you should take that journey with them to learn how gardens / nature works. Ecology will, hopefully, straighten itself out if we give it the tools (plants) to do so and not interfere (chemicals, moving, etc). Always good to hear from you. I’ve been enjoying your evolution lately. I think we need the perspective of “purists” as a part of this dialogue. You’ve been very thought-provoking. I guess what I’m saying is that design matters. It’s great to convince Americans to rip out our lawns, but the more terrifying task is what goes in? Sure native plants (or other beneficial species), but which species? How do we compose them? How do we maintain them? Here is the great knowledge gap. I’ve gardened and designed in a “naturalistic” style for quite a while with a rather large number of different sites, and at the end of the day, still approach every project with fear and trembling. I fail at it all the time. The conversation has to turn to design and compositional strategies that encourage enduring plantings. For me, I simply do not believe the premise that “ecology will straighten itself out if we give it the tools (plants) and not interfere.” For me, this is an underlying premise of much of the native plant movement that is highly problematic. It’s not to say that there aren’t serendipitous moments, but I fundamentally believe that even native plantings will require, well, gardening by us in order to maximize diversity, functionality, and beauty. We live in artificial landscapes with disturbed soils. I’ve been a part of many ecological restorations where invasives are removed, natives are planted, and then you know what happens? We have to continue to monitor the invasives and weed them. We have to water and encourage the natives to establish. All of this weeding and watering feels an awful lot like gardening. At least here in the mid-Atlantic, the default landscape on any disturbed soil is mostly invasive species. Planting natives and walking away is a recipe for failure. It’s time for the conversation to focus on design and composition that has a small chance of enduring in the face of the tsunami of invasive species that threatens to wash it all away. This is one of the most interesting on-line conversations I've ever taken part in. In my most recent project, a water feature using gabion walls, I've planted the top of the walls with intermingled sedums. A very small scale example of intermingling that is growing in well, and that looks good to my eyes. More significant is an old farm field where we are letting nature do the work. We cut the field once a year in early autumn to keep it under some control but otherwise let whatever happens, happen. It is a glorious field from early summer to late autumn. The hardest part for me is waiting and doing nothing. Plus ignoring the berm that now is covered with Canadian thistle. Yes, seems like sedums are a great example of plants that intermingle well. There are many examples of extensive green roofs with sedum mixes that exhibit beautiful mixed patterns when they bloom. Was your old farm field planted? Or was it simply managed from the start? I’ve had projects where we’ve used a management strategy (combined with a bit of planting) as opposed to a full removal/re-planting strategy. Each has its advantages and disadvantages. Though if you have a stable base of grasses already in place, seems like that’s worth keeping. This reminds me of a sandstone bluff over the beach in a regional park near where I live (Yellow Point, Vancouver Island, BC). It is a prime example of intermingling and massing combination. Large patches of sedum and Blue-Eyed Mary make way to patches of mosses that at the distance look uniform. However, when you look at the moss patch more closely, you see an tightly interwoven mat of different mosses, carex, short grasses, bulbs and perennials. You need to get down on your knees to really appreciate the diversity. Over the last 3 years, I have worked with three local (Mid-Michigan) schools and a childrens museum to rip up areas of lawn and establish gardens of native plants. Each of these gardens (even the smallest at 16ft x 30ft) has been planted with between 25 and 30 species to provide a sequence of nectar sources and host plants throughout the growing year. I want these gardens to be ecologically diverse; look planned initially, but allowed to evolve naturally; be useful for education; and be low maintenance. Because these gardens were going to be planted by elementary/middle school students and volunteers I had to develop an easy system for laying out the plantings. After removing the sod from the site, I lay out a grid of strings that forms 3ft x 3ft squares. Each individual square on the ground would be planted with 2 to 5 plants depending on species. Larger plants would be in smaller groups, smaller plants in larger clusters. Several connected squares (usually running diagonally through the garden)are planted with the same species to create corridors of like plants. The planting at the three schools have all been done according to plans where species would be clumped together in small groups of 3 to 15 plants of a given species.This was done with the understanding that some of those species would remain clumped where they were planted, some would spread, and some would actually move over time (whether by runners or seeds) to locations that the plants themselves found to be more suitable. I also know that some plants are likely to disappear over time in each garden as they are out-competed. Other grasses and wildflowers are going to appear when their seeds are deposited by animals, wind, water, etc. If those plants are native species I believe they should be left to grow. (I do remove all tree seedlings that find their way into the gardens.) Because the gardens are all at educational institutions all of this change is actually desirable; students use these gardens to study habitats, adaptations, and competition. I think that any garden using native plants, especially in a public space, benefits from some small degree of massing plants initially. The blocks of color and texture are more appealing to the eyes of most people. It also shows that the gardens are planned spaces, but the space should be allowed to evolve also. A natural habitat is not static, nor should a created habitat be. Ecologically, it seems more realistic to me also. Every wild habitat that I consistently visit is broken into a patchwork of masses of species, even if this sometimes is not apparent because of scale. Over time each species fits into its appropriate niche. Some plants will be scattered, but most will be growing in clusters with others of their species. When planting a garden with native plants I try to take this into account, but I know that the plants know better than I do where they will thrive and if they move over time so be it. I believe strongly that benign neglect is the best approach for most wildflower gardens once they have been established- over time they will approach that appearance of being a natural space. I really appreciate your thoughtful approach to planting and your commitment to public sites such as elementary schools. Your installation process is very logical. But I completely disagree with your philosophy of benign neglect. Seems like it is part of a romanticized notion that nature exists apart from us—so the less human input, the better. Artificial ecosystems are just that: artificial. Let’s embrace the artifice that is naturalistic design and create plantings that represent BOTH the beauty of wild plant communities AND the creativity of the human spirit. I originally commented because of the ecological implications posed by intermingling or massing species. I still stand by the idea the best way from an ecological standpoint is probably a combination of intermingling and massing. When plants of the same species are planted closely they have the best chance of being properly cross-pollinated, but a mass of a single species will suffer from lesser biodiversity both in flora and fauna. Intermingling species, will increase the overall biodiversity of the space and limit the possibility that a single traumatic incident (disease, infestation, drought, localized flooding) can eliminate one species from the space, but it can be more difficult for the plants to be properly cross-pollinated when individual plants of a species are widely spaced. I read your initial (retracted) comments and was not offended by them at all. Thank you for taking the time to look at the links I posted and commenting on them - I prefer honest feedback. We have different intentions when we install a garden. You are working as a designer for a client to create a beautiful space, that may or may not become a habitat for wildlife. I work as a environmental educator for a conservation district. When I plant a habitat (it's more of a habitat than a garden) at a school it is not to demonstrate how native plants can make a beautiful artificial landscape, but rather to create a habitat for wildlife that can be used as an outdoor classroom. Sometimes these habitats are planted with discrete clumps of plants. Sometimes the species are intermingled. Usually it is a combination of both. Sometimes it does not look the most beautiful. It is however biologically diverse both in terms of flora and fauna. I know after reading more of your blog posts that you don't like the idea of benign neglect or of low maintenance gardens. When I talk of benign neglect, I don't mean that I never do any maintenance on the spaces. Non-native plants are always removed when I find them. Paths through the gardens are kept clear during the school year and plants that flop over onto sidewalks or lawns are trimmed or removed as needed. My philosophy is more toward a hands-off policy on those native plants that were planted on purpose, those that have spread from their original location, or have blown in on the wind as seeds. The native plant community is allowed to evolve in the way that it wants. I don't (usually) remove one species in favor of another. I don't water once the plants have become established - even in drought conditions. If over time the garden composition changes, so be it. I have to plan for a garden that will receive no attention during the months of June-August and I want tough plants as a result. Every plant that I pick for a habitat is chosen not for its beauty but for its value to wildlife. If it is beautiful, great. If it is not, but is a good fit ecologically, that is great too. Here is an update on my gardens/habitats as of yesterday. Just out of curiosity, how would you plan for a garden like those that I deal with: a total budget of less than $1000 (usually much less) for all materials, planted mostly by elementary students, that will receive no water except rainfall, will not be maintained in any way during the growing season unless you personally do the maintenance, be composed entirely of plants native to the local area, be ecologically diverse, will receive no future monetary inputs, and go from lawn to habitat in less than 48 hours. Again, thank you for your time and thoughts. Thank you for your gracious response. My first response was unfair. I have more than my share of gardens that had a much better head start (more money and investment) that look much worse. And I very much appreciate your point of view about the priority being on habitat. And I very much agree with your hybrid approach to massing/intermingling. human landscape. It is a garden in the sense it is a hybrid human/nature landscape. Ignoring that context sends a message. At the very least, the bugs first, bugs only philosophy will have limited appeal to the broader public. ANd that to me is a problem. As to your last question about how I would approach a project like that: first, let me say that I think you are on the front lines of this issue. We need planting solutions that work for budgets like yours. So I am sympathetic. And your installation approach is one of the most logical, intelligent ones I've heard for a project like this. I guess my approach to a project like that would be to 1. raise the budget by 1.5 times, 2. plant much more densely with several different layers of plants (including a ground holding-one), 3. select natives from a short-meadow context (lower ones) so that the average height of the planting is 24-36 inches (there's a much higher tolerance for mixing when you can see across the top of a planting)4. perhaps install some kind of "orderly frame" around it (edging, hedge of low native shrubs--something to say that this is a designed landscape) 5. assign a supervised crew of volunteers to maintain it at least monthly and 6. re-plant every piece of bare ground the following two years with new plants (or at least divisions of the successful ones). I know, I know, that approach requires much more money, deeper design knowledge, and more investment from the community. But I feel it's the only way to do projects like that. It requires stronger advocacy and deeper commitment. It may mean doing a smaller project. But I think a smaller, better project is preferable to a larger one that fails to impress. But the alternative is the collective disappointment that happens after the fact when the planting is not attractive. At the end of the day, we are talking about creating artificial ecosystems, right? Particularly those meant to send a message to the world. So let's embrace a bit of the 'artifice'. Can't part of the message include: hey this is great for wildlife, it's beautiful, AND it's pleasurable for us. Yes, it's a higher bar to set. But we do it because it matters. Thank you for this dialogue! I've really enjoyed thinking about this with you. Amen! Thomas Rainer, you are my hero! Isn't it fascinating how different plantings can be year to year? I've had the exact same reaction with my small garden this year. What flourished last year is not at all what flourished this year. Despite all our designs and maintenance, there's always some aspect of the garden that is beyond our control. It's what makes this so fascinating (and challenging). Wow...I hadn't really thought of it being MORE ecological to intermingle plants...that would be tricky to prove, one way or the other...but it would be interesting. Every time I read through that new Oudolf/Kingsbury book, I glean new little bits of understanding...it's a fascinating concept (intermingled planting)...much easier in theory than in practice (at least for us everyday folks)! I do love the idea of designing a garden in the "spirit" of nature...while obviously you're never going to replicate it completely. The method of matrix planting greatly appeals to me...both for it's legibility from a distance, as well as it's complexity up close. I think that effect, of one or two dominant species, punctuated by a few other plants, seems very effective, simple and dramatic all at once. A great part of the book dealt with how "persistant" (I think that's the word they used) certain plants are (how some will die out, some will come to dominate)...and how, no matter how meticulous your initial design is...change is inevitable (as you've pointed out). I think it's that understanding of the constant ebb and flow of plants growing together that makes the idea so fascinating...you're accepting it and working with it...rather than asserting total control over it. I guess that's my way of saying that perhaps by having the plants intermingled to start with, you are acknowledging the fact that such a state is closer to what "might" happen in nature (blurring of the lines, so to speak). Of course, as you pointed out, there are many examples of plants communities in the wild growing in groups, or "blocks". Is it more ecological...maybe...maybe not...but it's a fascinating concept...and I really like how it engages us to think of gardens, not as something we decorate and are done with, but as something we set in motion and participate in throughout time…something we are part of. Sorry to ramble! You make excellent points. I am really interested in what you said about ‘persistance’. Yes, that’s a bit part of this conversation, right? The degree to which we ‘let go’ versus insist on control? Part of what appeals to me about Oudolf’s plantings are how highly controlled they actually are. It’s funny, because his work is more often associated with looseness and spontaneity, and while there’s some truth to this, his plans show great thought given to highly stable planting strategies. He avoids self-seeders; the perennials he selects tend to be very long-lived varieties that spread clonally—but rarely need division; and his composition emphasizes covering the ground with plants that persist. The plantings look loose and natural, but arrive that way because they are designed within an inch of their life. And maybe it’s ok to admit that as naturalistic gardeners and designers, control is still something we are after. I’m happy to let a few choice flowers self-seed over my garden, but when one species completely shades out another, leaving a big hole in my border, then I want to intervene before the Ailanthus moves in. To create these natural-looking perennial meadows, we have to remember we are actually creating early successional landscapes. Keeping them in this state of frozen succession requires quite a lot of gardening. Great comments, Scott. Always fun to get your point of view. I think this is an important point that routinely gets overlooked. Naturalistic gardens are not natural. They are highly controlled. When you lose control, they end up looking like a vacant lot. I think the most obvious examples are Japanese gardens that so many people hold up as paragons of nature when they are actually paragons of control, but the Oudolf plantings also reveal this. Katy is right about large sweeps of flowering plants being more beneficial for our pollinators. I read a book by the Xerces Society that states that mono cultures which includes our American lawns has done more harm for pollinators by creating a very fractured landscape. Imagine if your a bee and you have some road side weeds to collect pollen from and then you hit up against hundreds of acres of soybean or corn or lawn- your screwed. The Xerces society encourages planting large drifts of the same flowering plants so pollinators can see where to find food. In terms of the whole movement to create prairie style planting or meadows yes it has been a trend- a very serous trend for the past 20 years which I believe was inspired by Oudolf's style of planting. I know many designers who were disturbing natural meadows and making meadows full of non native plants- which by the way do not last and require a great deal of maintenance. Later as the native plant consciousness caught on I began to see where they were doing it with native plant plugs rather than seed. Yes, that's it. I remember reading that. In early July, I took part in a planting design workshop led by Piet and Noel at the Oudolf garden in Hummelo where the topic of intermingling was explored in detail. Oh, that you could have been there – it would’ve answered many of your questions. I suspect they’d have no argument whatsoever with your assertion. In fact, Piet has been working along these very lines for at least the past five years – designing plantings which combine matrix and block planting in tandem with successive layers of specimen, scatter and accent plants to help unify the design. As I see it, this combinatory approach appears to be the signature evolution of his explorations, particularly over the last decade. While in the Netherlands, I also visited a pair of more recent public projects Piet designed in 2009 for the riverfront in Rotterdam – in Leuvehoofd and Westerkade – where he uses a combination of matrix and group planting to astonishing effect. We also discussed his latest experiment at Hummelo where he’s seeded over the former nursery area with a wild meadow planting of Dutch forbs. This is the primary layer over which he rather elegantly scattered leftovers from the nursery along with coppiced shrubs to give it slightly more structure. Piet and Noel see this kind of intermingling with seed mixes as a way to democratise the whole concept in the future for public plantings while making it cost-effective too. The other thing to consider in all this is the need for a new design language to work with these new elements in the designer's toolbox. That’s another area where Oudolf has perhaps far outdistanced his peers – by developing a highly specific design alphabet to render his combinatory planting concepts in plan. For those struggling with the concept (and it requires some definite spadework), the latest book is a terrific place to start making it their own. Always good to hear from you. You speak for Noel’s point of view quite articulately. I agree with you. I have no doubt that Oudolf would vouch for a combination approach that embraces both massing and intermingling. Most of his projects over the last decade play with this approach. The effects are astonishing—as you say—and it is exactly where I hope the dialogue should focus. That being said, I do think there’s a bit of a dichotomy between Oudolf’s projects and Noel’s writing on this subject. I think you and I discussed that when I reviewed their latest book, Planting: A New Perspective. My impression is that Noel’s writing seems to emphasize intermingling more strongly than Oudolf’s actual projects do. Even in his highly mixed plantings, there is almost always a dominant plant—pointing out to me, at least, the cautious way that mixed planting must be approached. But it was Noel’s recent article in Topos that got my attention. Here he makes the case that intermingling creates an ecology that block planting alone may not. That is the subject of my question—whether more mixed planting results in higher ecological quality or more stable plantings. I absolutely agree with your last statement about Oudolf’s rather brilliant “design alphabet”—his diagrammatic approach to creating plan view drawings that show vertically layered plantings. I’ve spent many an hour combing through these plans with great interest. I also wonder how Noel might support his assertion. Perhaps something about biodiversity requiring actual diversity to promote dynamic change? You're right about the variance though. After seeing them up close, I think it's part of their dynamic as a creative duo –- Noel is more the gifted theoretician and articulator while Piet is the experienced plantsman/visionary who can both see in the abstract and make it work in the ground. Thomas, you have obviously chosen a good topic for your upcoming book, although I agree with Anne Wareham that perhaps the internet is a better forum for discussion. Once your book is published and we read it, we can all bring more the discussion. Until then, I will cast my vote with those who advocate a mingled approach. Mingle on with your bad self! I hope we can use the Internet to advance this discussion. We all have a lot to learn from these brave new design times. What a great topic Thomas. I look forward to your book. I used to implement the intermingling concept when clients asked for a native landscape in their backyard, thinking diversity was key (which is it on a large scale). I've learned over the years that to further my agenda, which is making native landscapes more mainstream and less "ball-shrub and barberry", the landscape needs to be fairly easy to maintain. Folks still have "low maintenance" on the top of their list when venture into the world of native landscaping, so, I've found that massing keeps the confusion at bay as to what to pull out and what to keep. There is no such thing as no maintenance....keeping native landscapes fairly straightforward from a maintenance perspective renders native landscapes more palatable. My hope is that neighbors with monster lawns visit my clients for a backyard grill out and are convinced that native plants are a better choice. I've had a very similar experience. For me, ease of maintenance often means not heavily mixing plants--though some is indeed possible. I feel a deep urgency to convince Americans to let go of their lawns and clippers, so an attractive (which here in the US means orderly) plantings is the first step in getting people to do that. We have to seduce the American public into wanting a more natural aesthetic with plantings that show the beauty of the wild American landscape. Keep fighting the good fight. One by one, it will happen. In the UK we have a series of books which have tried to classify all the plant communities we have in a practical way and we use the classification terms as short hand to describe a plant community ( more information here http://jncc.defra.gov.uk/page-4259 ). Almost all of these plant communities are either directly or indirectly influenced in some way by man – we are a small country with lots of people everywhere, not like in the USA. Each community is described by a table listing all the plants found in that community, their frequency (how often you come across them in the community) and how much space they take up. Similarly, some plant communities in some conditions will self-maintain themselves better without much human input whereas others need management input to maintain a diversity of species. More importantly from a horticultural point of view is how easy and expensive is the planting to maintain. If you can’t maintain it, then it won’t last. Anne Wareham’s comments on our meadows in the UK are slightly misleading. Most of our wildflower-rich meadows (NVC classification MG5) were ploughed in the medieval period and then the majority of those remaining were ploughed as part of the war effort in the first and second world wars. Many of those left after that were improved (i.e. weedkiller and fertilizer added) in the 1970s and 1980s and became more financially productive but without the wildflowers. The tiny bits left now are either well looked after or suffer from lack of grazing and scrub encroachment rather than being ploughed up. New meadows are being created often on ex-arable land (I am involved with a 10 ha project) and some projects to improve the area of meadows have been extremely successful like this one in North Yorkshire http://www.ydmt.org/programme-details-hay-time-14609 and the hay meadows in upper Swaledale are stunning. Ironically, going on the discussion above one of the reasons for their visual appeal is their super-abundance of yellow Meadow Buttercup and their ‘frame’ of dry stone walls (Google image search for Swaledale Buttercup Meadows and you’ll see what I mean). very interesting discussion thread this - thanks to Anne for pointing it out on her Twitter account. Thanks for your contributions on this thread. You said it well: "An either/or discussion about intermingling and blocking and their relative ecological worth doesn’t really make sense." Couldn't agree more. And I'm sure that even most of those advocating for a more mingled style would agree with that statement. My only point was that there is an undercurrent in naturalistic design that says that mingling plants is more "natural" and that grouping is more "conventional" or "traditional." The general vibe (sometimes explicitly said) is that grouping plants is somehow less ecological. My point is that this is a flimsy claim. Both grouping and mingling are strategies wild plant communities use. The more productive conversation, in my humble opinion, is to move beyond this binary frames an look to how climax plant communities are organized (functionally and aesthetically) to give them stability. Websites like the NVC (the US has equivalent versions) are very helpful to this end. Great to have you share your knowledge. Your meadow projects are fascinating. From what you have said I don’t think that you are looking to recreate ‘climax’ communities – what you seem to be seeking is a plant community that is stable under a given management regime. For example, recreating the horticultural equivalent of a stable Hazel coppice community is entirely possible where the management would be cutting down the Hazel every 10 or so years. I don’t know that it would be thought of as a ‘climax’ community ecologically as without management it would, in theory, develop into high forest. However it would be a stable community, albeit one in which the major floristic interest would vary depending where you were in the coppicing cycle. As Don Statham mentions above, within ‘natural’ plant communities the relative visual appearance changes year on year anyway so you would presumably not have an absolute vision of the end point but parameters within which the visual appearance of the community would stay. If it is the case that the goal is to develop a plant community that is stable under given management conditions then you could say that an herbaceous border is a stable plant community for a plot of land that is managed as an herbaceous border. Which brings me back to your goal seeming to be to develop horticulturally interesting plant communities that are more biodiverse than the vegetation that existed before on that land, are still visually attractive and, crucially, that are relatively low cost/affordable to maintain. With regard to the grouping/intermingling debate, which I’ve deviated from above, like anything the devil is in the detail. A design where all the plants are intermingled, but in an absolutely repeating framework will look just as manmade as a design of regularly spaced blocks of plants. An intermingled design where the plants are of no use to the local fauna is worse from a biodiversity point of view than one with blocks where every plant is beneficial to local insects. I also note the phrase “is somehow less ecological” which is similar in style to the phrase “annual meadow” which is popular in the UK at the moment: neither make sense if you look up the meaning of the words involved, but perhaps this is people using them in a new context that we will all have to get used to somehow. "Your goal seeming to be to develop horticulturally interesting plant communities that are more biodiverse than the vegetation that existed before on that land, are still visually attractive and, crucially, that are relatively low cost/affordable to maintain." That's it precisely. I think it is possible. Lord knows there are tough enough plants out there to survive (and thrive) in almost any urban condition. We are limited in only our knowledge (mine included). That's where I hope the conversation, research, and energy goes. It is the future. You may be right about many meadows (though I think, like woodland, we don't have to go back to medieval for merit?) but I think that more have come into private hands as farmers have diversified. How and when are seed banks terminally destroyed? It may merit greater investigation. I think conservation of grassland is not taken seriously, largely, I imagine, because of views like your own? Do we know how much might be worth attention? I have no strong beliefs in this area, but I think devoting some time and thought to ecological as well as aesthetic concerns MUST be a good thing in the big picture. Of course, we have yet to hash out, document, and quantify what are the “best” ecological practices. In this thread, I noticed several comments that refer to what is happening below ground as well as above—“on the horizontal and vertical planes both above and below ground” as commenter Lucie wrote. Mostly, the mixed vs. massed debate seems to focus on what it going on above ground. Has there been much focus on root compatibility and what's going on below ground? I am thinking of ornamental gardening books I’ve read which focus on really packing in the flowering plants by layering on top of one another those with substantially different (and theoretically non-competing) root systems—tap root, medium-deep fibrous roots, bulbs, surface roots or rhizomes etc. Is this an area in which mixed planting might hold a clear advantage? Better using the soil? Ultimately supporting more plant density? Yes, I think you are on to something by thinking below the ground. The idea of layering plants in different strata that play well together. That's a solution I'm exploring now (albeit, not very scientifically). I think it has promise. Great to hear from you. Dear Thomas, it is wonderful to count with your blog for interesting debates, I love reading it! I am afraid it may be because english isn´t my native language, but I do not infere the same as you do from Noel´s quotation. Probably it would be easier to understand what you debate if one could read the whole article. I understand that he says that intermingling "plant combinations" vs minimalist planting like for example the very successfull Fernando Caruncho (I looove many of his gardens, but certainly its main feature is not to particularly favor biodiversity) the first create a richer ecology than the second. From the second part of the frase I understand that he is comparing the convential planting (that mostly everyone did until this new wave) where if one plant self seeds it will appear as a red flag and needed to be taken away as soon as possible. The intermingling allows a Verbena bonariensis to self seed to some point without ruining the design. Ecology would take over if let into a conventional planting as succession in ecology does. We are always stopping ecological succesion in a border/garden, unless you create a climax association, which can be sometimes boring as usually only a few species conquer the area. At least from this quotation I don´t see where Noel says that the High Line would hold more biodiversity than the Lurie, where you can definitely see combinations of blocks (even rivers of salvias). I think he was talking between minimalist vs naturalistic. I may be wrong... why don´t we ask Noel??? It's great to connect with you. I've read a good bit about your work in Noel's writings. Sounds like you are doing some fascinating experiments. I quite agree with your assessment of the quote. I certainly don't mean to heap too much meaning on a single quote from Noel. I'm sure he would say that massing plants in blocks is entirely appropriate in some situations. I myself am quite interested in the potential that intermingling plants has, both in terms of aesthetics and function. I'm quite enthusiastic that this is the trend. My only point, however, is that in our enthusiasm for intermingling, we have a healthy discussion of its limitations. Great examples of intermingling such as the High Line spawn many imitators. Already in America, we are too obsessed with our neat lawns and clipped shrubs. If naturalistic plantings get further associated with wildness or messy-looking arrangements, then we will limit their popular appeal. So as we explore intermingling more, let's also let have conversation about how we can make mixed plantings more accessible to a broader audience. Great to hear from you. I look forward to hearing more from you in the future. This is SO thoughtful and, by me, appreciated... The common practice now of cramming a lot of "native" species together in public plantings with no discernible design is beating the milk out of the cow. I was fortunate to be a tourist in New York and DC this summer and had a wonderful visit to the highline, which, like other gardens by Piet Oudolf that I've visited, was a planting masterpiece. Adversely, I saw many of the same plants used in public spaces around the Washington Mall that were miserable failures - largely because the designer seemed to be throwing plants off a truck. There was no rhyme or reason - just chaos. I feel like the sweet spot in garden creation is the moment when the artist is able to intentionally communicate an interpretation of a natural universality - a prototype that we all understand, like the structure of a sentence or song - that then communicates the artist's message through an accessible conduit. This ability is an instinctual one and not everyone can pull it off. To me, the rest of the conversation about whether we mix and mingle or mass or whether wildlife will be present or whether we should use this body of plants over that one or... whatever... is superfluous. Gardens are works of art and the constant discussion over how we mix the pigments is distracting. Yes, I'm quite familiar with the "throwing plants off a truck" look. For me, the trend among some in the native plant movement to entirely discount the human aesthetic dimension is troubling. I entirely agree with you statement about communicating an "interpretation of a natural universality"--it's a nice way of putting it. But in order to do that, we must understand HOW to pull this off. That means understanding compositional strategies such as intermingling, massing, and hybrids of those two. You can't get the work of art without understanding how to mix the pigments. Trying to intermingle plants requires understanding a plant morphology's in relationship to a community of other plants. This is not just intuition and magic; it is skill, knowledge, and experience. It is worthy of dialogue. nteresting post, I love the blog and I love the discussion. However I have quibbles with this sentence "well-designed mix planting can actually replicate much of the function of wild plant communities"
First, what is the evidence for that? If you check the scientific literature on native gardens you will see that results range from natives making no difference whatsoever to increasing diversity at a local scale, but in no study you find that well designed garden (intermingled or not) add to species diversity at the regional level (the difference between alpha and beta diversity). I see a lot of gardeners trying to be more ecologically responsible and I think that is great, but let's not loose track of two things. 1) No matter how much you try to replicate the natural vegetation cover you simply cannot completely re-establish the entire complex network of interactions of a ecosystem. So let's try to better understand it but not forget that plants are not the only thing structuring communities, there many top down effects and other factors. 2) I think the discussion is relevant but it distracts from a major issue. We keep talking about garden design but there is a global crisis of species decline that is linked to forest fragmentation and species invasions, these 2 factors account for 90% of extinction rates. So, while a more eco-friendly garden is a good thing, it will simply never replace the natural habitat. I know the author of the blog is not implying that is the case, but I can see how this would become a distraction. A single garden may not impact diversity at a local scale, but in aggregate they can. I don't have the numbers in front of me but they can be found in Emma Marris' book. Los Angeles has something like 16 native tree species but because of garden plantings there are hundreds of tree species here. Do you not think that there are more complex networks of interactions because of order of magnitude increases in species diversity even if they aren't native? When it comes to plant diversity, gardens indeed increase local plant diversity. Plant diversity is not natural in gardens, because we tend to clump as many species as possible. The BUGS experiments in england showed that (http://bugs.group.shef.ac.uk/BUGS1/updates.html). The abundance of resources (fruits, leaves, and flowers) is so remarkable in urban gardens and different than what you find in nature, that insects even change their host plants. The presence of exotics are also another factor increasing diversity. For instance, http://onlinelibrary.wiley.com/doi/10.1111/j.1752-4598.2010.00103.x/abstract shows that butterfly bush, and exotic, can explain most of the diversity of insects and natives failed to increase diversity. I understand the issue of complex networks, but do these gardens actually add to complexity or merely replicate on single aspect of networks (plants and organisms that interact with them). Even if you consider that birds may eat the insects that feed on plants these native gardens simply cannot host large predators, do not increase soil microbiota, detritivores, etc. We just get plants that look pretty are somewhat herbivore resistant and that by itself does not establish a complex network. The fact is that most ecology concepts are either ignored by gardeners or are impossible to manipulate. There are several factors that influence diversity. Such as island biogeography (gardens cannot be big enough to host large predators), connectivity of fragments, homogenization of species caused by urbanization, and the list goes on and on. So my opinion is that it is a illusion that gardens and conservation are the same thing, heck not even assembly rules or neutral theory is considered (http://en.wikipedia.org/wiki/Assembly_rules) when it comes to gardening. Like I said before, a mere arrangement of plants will not cut it. Especially because we can barely identify what is present in natural habitat as is. And increasing diversity is not the solution to all problems. Dumpsters increase the diversity of mammals in urban areas, but you see no one advocating to sustain larger populations of rats, squirrels and racoons, and hawks that eat those animals by having more dumpsters. Gardens, just like dumpsters, have a direct effect on very common species that are already adapted to urban and semi urban environments. I am yet to see a meta analysis showing how good gardeners are to rare species and not simply urban ones. That said, here is one role that gardeners can play that in my opinion is largely overlooked: education! Gardens for many are the only contact that people will have with nature. So perhaps your garden can teach other about rare plant species. For instance everybody ask me what are the lavender flowers in my yard and I say it is the rare Scutellaria ocmulgee, same thing goes Dodecanthra sabatia, and Neviusia alabamensis. I know that my argument is complicated but it is because people complicate things too much trying to make a more sustainable gardener and following some scientific thought but ignoring the all evidence that it is available. Here is one simple message to stick to. Plant more gardens, they are sustainable to begin with because the alternative to gardens is concrete. Avoid using exotics, because you do not know what is going to happen with them in the future, the beautiful budlleia of today may be the kudzu of tomorrow. Finally, plant rare natives species, people may simply appreciate nature more because they seen it once. I'm not sure I claimed (or anyone else to my knowledge) that using native plants will "add to species diversity at the regional level". For all of us interested in more ecological gardening practices, our goals are typically pretty modest: to make whatever site we're working on somewhat more ecologically beneficial. Sure it won't replace the natural habitat, but as you said, that natural habitat is shrinking at a rapid pace. Surely you don't mean to imply that we shouldn't try? I'm not sure I understand your point about "distraction". I personally may not be able to change the development patterns of the world, but I can at least make the sites I design better-to the best of my knowledge. Is there no value here? I'm currently working on a project to plant 620,000 native trees over a 200 mile area that spans four states. I don't think we should discount the positive effects we can have. I think what I meant by replicating the function of wild plant communities was not that we could create carbon copies of all the complexities of a real ecosystem. Instead, I'm more interested replicating their (relative) stability. That requires understanding their different layers and what garden-type management might simulate those conditions. I guess my problem is that some people have the illusion that using some natives in their garden would help mother earth Here is on scenario that this could back fire. You plant a native garden in a urban or semi-urban area. You are not attracting the really rare species, but most likely you are only favoring the ones that can tolerate urban areas. This adapted species can now expand its population because you provided more resources for it. However, this expanding urban adapted species pushes its range into the transitional areas (edge of native forest). The species that like in the edge of forests now are now competing with urban adapted ones because the butterfly garden provided more resources for them. People, may think this is unlikely because these native gardens are helping pretty birds and beautiful butterflies, but let's get raccoons for example. Their population exploded because of human activities, and they now are a pest in transitional habitats, out competing small mammals that were important seed dispersers. Same thing goes for deer, opossum, sparrows, and doves, that contribute to the homogenization of diversity. So in the end what was simply a butterfly garden can have many unintended consequences. So my point is. Gardening is not conservation and will never be. Even if you only use natives plants, because you can actually have cryptic invasions, or favor native pests. Now, that said I totally agree with you that the goals of gardening are pretty modest, if using native plants may not save us from doom, using exotics certainly can speed up extinction rates. Worse yet, not gardening may simply result in more concrete. In that sense then lets try to use more natives in our gardens and try to use in a more natural way (and your blog does a fantastic job on that matter, I do mean it). But let's not loose track of the real problem. So to summarize, native gardens may not solve the issues and can back fire, but they have less unintended consequences than an an exotic garden. Gardening can be good, but if one were to choose only one effort to prevent nature decline they should pick "forest fragmentation". Just to throw one idea for another post later in blog "How much are you helping with garden?" And one more thing, 620,000 native trees over a 200 mile area that spans four states, is a big restoration project. Well done! Thomas. Whatever are we to make of this post and your reply? Nameless trolls making nasty inappropriate comments is one thing (this is the internet after all) but condoning them is quite another. Am I missing something about the "smiley" subtext here? Because at face value, the original comment is highly offensive and rather personal. It also has zilch, zero, nada to do with gardening. I read it more silly than nasty. Just trying to roll with a heckler rather than lecture them. But if you are offended, I will be more than happy to remove it. Discussing it any further gives it more credence than it is worth. Agreed. Much thanks for clearing that up. This is a very interesting discussion and has touched on a lot of great points. I think one thing that hasn't been discussed though is the ecology of individual plant species. 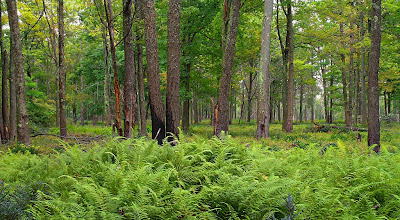 Some plants do grow naturally in large masses (like hay-scented fern) because they spread by runners or there is an extensive seed bank of a species that benefits from fire or flood scouring or some other large-scale disturbance. Other plants tend to grow intermingled because of their seed dispersal, germination and growth requirements, and life histories and competitive abilities. Most landscape designers know the basic growth requirements of a species, but they think very little about its interactions with other species (plant, fungal, and animal). A second point is that many large swaths of a single species of a plant in gardens are not just a single species but are also a single cultivar. In the case of aspens or hay-scented fern or other highly clonal plants, you may get a large swath of genetically identical individuals in a natural setting, but in most cases you would have a population of individuals with some amount of genetic variation. This genetic variation helps the population to survive and adapt to insects, diseases and changing climate. Unless you're starting plants from seed, it can be very difficult to find ornamental plants in the nursery trade that are not cultivars and are not just being grown for restoration projects. I'm concerned that the trend in ornamental horticulture is continuing to move away from preserving the genetic diversity of native plant species and could result in large garden populations of plants that are extremely susceptible to environmental changes. Many great points, Sylvan. I share your concern about asexual propagation techniques in the nursery trade; we must insist on more seed propagated plants. I learn numerous content inside your webpage.I used this site to get information for that i had in my class. I want to thank you for this informative read... Keep it up. Keep blogging. Hi Thomas, I have just stumbled across your blog and am greatly enjoying your thought provoking essays. I think you are right to question the "ecological" claims of the so-called intermingled style of planting - I think it is just that, a style or fashion of horticulture, and I have absolutely no problem with that. As several others have suggested, it seems to me that monocultural blocks of plants do occur in nature, especially where conditions are tough and species diversity is low - woodland floors carpeted by just ferns, or by swathes of English bluebells here in the UK for example. I have observed similar effects in deserts where a single species or plant association can dominate huge areas until some subtle difference in soil depth or permeability favours a different plant or community, or no plants at all, for another great expanse. Tidal estuaries are another case in point; I live beside one now and can pretty much run a straight string line between huge areas where only phragmites australis grows and adjacent areas where only sea grass and sea aster grow, the demarcation drawn, I guess, by differing degrees of salinity tolerance. Old meadows and prairies have a similar equilibrium whilst incorporating a higher species diversity, with more intermingling and this seems to be the type of habitat that Oudolf and Kingsbury take to be the ideal or norm, in an "ecological" and even a moral sense, and this is where I find their ideas problematic - it seems rather prescriptive, even intolerant, whilst hiding behind a mask of "naturalism". Does it reflect, I wonder, a particularly Northern European set of sensibilities about "nature" and man's place in it? Latin American Satellite Technologies Used for Handling. Research Project Atomic Microscopy Laboratory. Hypothesis on cases of L.A.
Handling for criminal activities of Asian politicians in Venezuela, Prime Minister of China, Li Keqiang, Shinzo Abe, Kin Jon IL. Handling for criminal activities of Asian politicians in Venezuela, Agencies: USA, CANADA, EUROPE, ASIA and LA. Politics and sons making money with satelital technologys. If you liked this post . . .
Thomas Rainer is a horticultural futurist fascinated by the intersection of wild plants and human culture. A landscape architect by profession and a gardener by obsession, Thomas has worked on projects such as the U.S. Capitol grounds, the Martin Luther King, Jr. Memorial, and The New York Botanical Garden, but is happiest puttering in his small garden in Washington, D.C.
Thomas thinks you should use more natives, plant more daringly, and loosen up that landscape, for crying out loud. The quality of our environment affects our health and spirit. Gardens are points of connection, grounding, and continuity. Well loved spaces amplify living. Nature should be interpreted, not imitated in designed landscapes. Planting design should be bold, daring, and uncompromising. We can reclaim biodiversity and habitats within human landscapes. A good day ends with dirt under my nails, grass stains on clothes, and dreams of the next garden. "(Thomas' lecture at NYBG) was a turning point for the next generation of garden designers that take into consideration both the art and ecology of great garden making. Thomas has a new contemporary voice." "Thomas, perhaps the first theoretical horticulturalist of the social media generation, has a true blogger’s ease with the first person voice." "If I only had time to read one blog, this would be a serious contender." "So often I read your posts twice, even three times because they're THAT good." "I came across your blog recently and have read almost every post top to bottom in a frothing frenzy." "I love gardening and I love good writing and this blog is the best fusion of the two I've seen on the web! Wow!" "This is one of the best blogs I've ever read. You are a man after my own heart. I wish I had written this." "As a general rule, I don't tell people what to do, or what websites to visit, but this is a 'must read' blog. I've been in this field over 40 years . . . I rarely read anything about gardens, gardening, or design that I don't know. When I see there's a new post on Thomas Rainer's blog, I get excited . . . I've yet to be disappointed." "Every time I read a post, I want to shout 'YES! YES! You are so right!!'" "Your blog is the one I look most forward to: always engaging, always thought provoking." 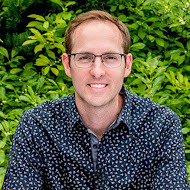 "The writer combines his vast knowledge of landscape culture and his gift as a writer to produce fresh, innovative, attention-grabbing, and at times inspiring posts--post after post." "I browse through many gardening sites, but this one has very quickly become my favorite." "these words are superb . . . anointed . . . "
"I enjoyed it so much we read all the way back to the first posting, and then subscribed." "The good earth viewed by a visionary pair of eyes. " 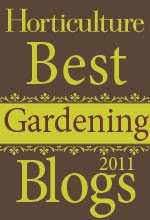 "I love your blog--it is like reading an excellent garden book! Only better, if that is possible." "An exciting convergence of landscape design and art, narrated by a visionary gardener-poet. By far, this is my favorite gardening blog." "This is no mere garden blog. With each posting, he takes the reader on a journey from which few would want to return." "The posts are exceptionally well written, and I almost always come away from them heady with new ideas and new ways of seeing." "These really are the best articles we've read in ages." Winner of Horticulture Magazine's "Best Gardening Blog"
The Most Beautiful Landscaped Flower Garden in Thailand. The U.S. Botanical Garden, D.C. Copyright 2009-2012. All rights reserved. Thomas Rainer. Simple theme. Powered by Blogger.